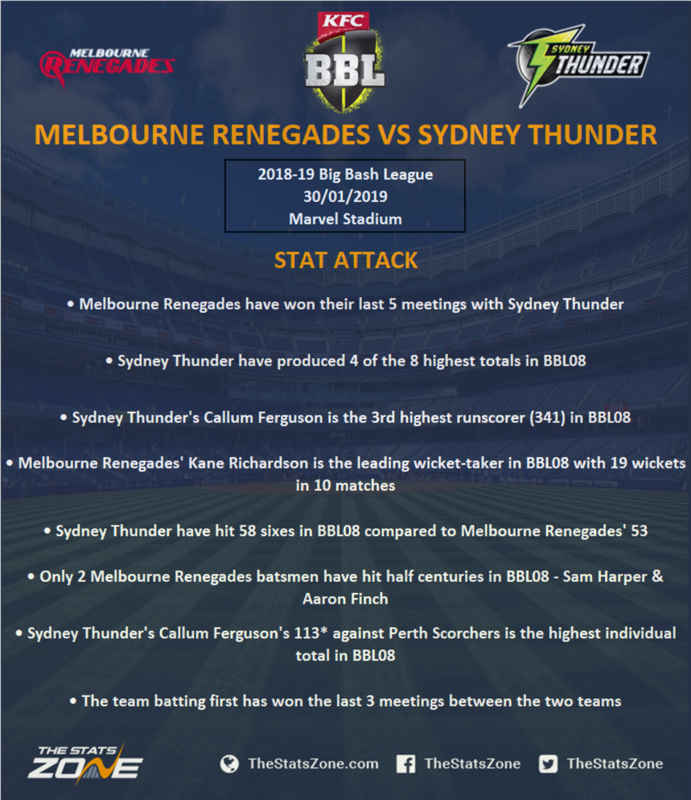 Melbourne Renegades produced a superb bowling display to see off Perth Scorchers last time out to put their BBL08 fate into their own hands as Chris Tremain starred with figures of 3-9 from his four overs as he set the tone for a 78-run victory. With a cluster of teams fighting it out for a play-off spot and the ladder looking extremely congested, back-to-back wins have helped the Renegades progress to 14 points and can all but seal their top four spot by beating Sydney Thunder in this game. They will have to do so without batsman Cameron White who had to retire hurt with a hamstring injury against the Scorchers while Joe Mennie is also out of the squad with Jon Holland and Jack Wildermuth coming into contention for the Renegades. Sydney Thunder secured a hugely important win against Perth Scorchers in their last game to stay in touch with those above them in the race for the play-offs. The Scorchers posted a winnable total of 181 but the Thunder were able to chase them down with four balls remaining. Key to that run chase was Callum Ferguson, who hit a scintillating unbeaten 113 off just 53 balls as his partnership with Matthew Gilkes was key and despite him being offered little support from elsewhere, Ferguson was able to remain composed and guide his side to the win. 19-year-old wicket-keeper Baxter Holt will be given a baptism of fire behind the stumps as he makes his debut with the Thunder having two ‘keepers unavailable as Gilkes suffered an injury in the nets yesterday whilst Jay Lenton is also out which makes Holt the fourth wicket-keeper for the Thunder in BBL08. Melbourne Renegades host Sydney Thunder in a vital game that could have big consequences for the loser. That is definitely the case for the Thunder who could be pushed out of play-off contention with a defeat. Both teams beat struggling Perth Scorchers in their last outing but know this will be a tougher contest with both capable of winning. The Renegades will need to be better with the bat to win this one but their bowling attack should have too much for the Thunder.